Approximately 45% of all deaths in the Western world can be attributed to fibrotic diseases resulting from the increased accumulation of collagens in the internal organs or tissues [1 Wynn TA. Cellular and molecular mechanisms of fibrosis J Pathol 2008; 214: 199-210.]. Fibrosis is able to manifest in almost any organ that contains fibroblasts, including lungs, kidney, liver, and heart. It can affect a single organ or be systemic affecting numerous organs. The causative agent precipitating the development of fibrosis is often unknown; however, in some cases fibrosis can be attributed to pathogens [2 Wootton SC, Kim DS, Kondoh Y, et al. Viral infection in acute exacerbation of idiopathic pulmonary fibrosis Am J Respir Crit Care Med 2011; 183: 1698-702.,3 Collazos J, Carton JA, Asensi V. Immunological status does not influence hepatitis c virus or liver fibrosis in HIV-hepatitis C virus-coinfected patients AIDS Res Hum Retroviruses 2011; 27: 383-9.] or inert substances such as radiation [4 Yarnold J, Brotons MC. Pathogenetic mechanisms in radiation fibrosis Radiother Oncol 2010; 97: 149-61.] and chemicals [5 Daba MH, El-Tahir KE, Al-Arifi MN, Gubara OA. Drug-induced pulmonary fibrosis Saudi Med J 2004; 25: 700-6.]. To date, there are no FDA approved drugs that control the accumulation of collagen in tissues. The inflammasomes are pattern recognition receptors that have recently been identified that are capable of recognizing a diverse range of conserved molecular motifs unique to microorganisms. In addition, they can detect chemical alarm signals produced by activated cells that are associated with host infection and tissue damage [6 Martinon F, Tschopp J. NLRs join TLRs as innate sensors of pathogens Trends Immunol 2005; 26: 447-54.]. The main function of the inflammasome is to upregulate and activate the innate immune system via the secretion of IL-1β. There are different classes of pattern recognition receptors and all are evolutionary conserved e.g. toll like receptors, leucine rich repeats, and NOD-like receptors (NLRs). These receptors are involved in a wide variety of ligand sensing and in combination lead to the increased expression, and activation and secretion of IL-1β and IL-18. With the discovery of the inflammasome, it was found that leucine rich repeats contained within NLRs are a new class of pattern recognition receptor consisting of varying numbers of leucine repeats that allow the protein to fold into three dimensional curved structures [7 Bella J, Hindle KL, McEwan PA, Lovell SC. The leucine-rich repeat structure Cell Mol Life Sci 2008; 65: 2307-33.,8 Hindle KL, Bella J, Lovell SC. Quantitative analysis and prediction of curvature in leucine-rich repeat proteins Proteins 2009; 77: 342-58.]. These curved structures bind specific ligands found on pathogens [9 Bell JK, Botos I, Hall PR, et al. The molecular structure of the Toll-like receptor 3 ligand-binding domain Proc Natl Acad Sci USA 2005; 102: 10976-80.]. NLRs are comprised of an N terminal effector domain, a central NOD or NACHT (a domain found in NAIP, CIITA, HET-E, and TP-1 proteins) and a ligand sensing C terminal leucine rich repeat domain [10 Inohara N, Nunez G. The NOD: a signaling module that regulates apoptosis and host defense against pathogens Oncogene 2001; 20: 6473-81.]. Currently, twenty-three NLRs containing NOD and leucine rich repeat domains have been identified and have been sub-classified by their N terminal region; NLRC 1-5 contain a caspase recruitment domain (CARD) protein, NLRP 1-14 contain pyrin, and NAIPs contain a BIR protein [11 Kanneganti TD, Lamkanfi M, Nunez G. Intracellular NOD-like receptors in host defense and disease Immunity 2007; 27: 549-9.]. An inflammasome is comprised of an NLR receptor that is the sensor. The NLR sensor is thought to detect the alarm signal. The mechanism of detection of that alarm signal is yet to be fully elucidated but once activated, this sensor induces the complex formation that is called the inflammasome. The inflammasome associates with an adaptor protein (e.g. apoptosis speck like protein containing a CARD, ASC) and also associates with pro-caspase-1. The resulting association of these proteins causes in the cleavage of caspase-1 and subsequent activation of that protein. The NLRP3 inflammasome is one of the most extensively studied inflammasomes and is capable of sensing a wide variety of alarm signals [6 Martinon F, Tschopp J. NLRs join TLRs as innate sensors of pathogens Trends Immunol 2005; 26: 447-54.]. Recently it was found that the assembly of the NLRP3 inflammasome requires the presence of reactive oxygen species [12 Dostert C, Petrilli V, van Bruggen R, Steele C, Mossman BT, Tschopp J. Innate immune activation through NALP3 inflammasome sensing of asbestos and silica Science 2008; 320: 674-7.]. The direct positional involvement of the endoplasmic reticulum (ER) and mitochondria was also shown to be very important in this signaling [13 Zhou R, Yazdi AS, Menu P, Tschopp J. A role for mitochondria in NLRP3 inflammasome activation Nature 2011; 469: 221-5.]. The role of the mitochondria in the innate immune response has been well characterized and has been reviewed by West et al., [14 West AP, Shadel GS, Ghosh S. Mitochondria in innate immune responses Nat Rev Immunol 2011; 11: 389-402.]. Quiescent NLRP3 is localized to ER structures; however, once the inflammasome is activated, both NLRP3 and ASC redistribute to the perinuclear region of the cell where they co-localize with the ER and mitochondria organelles [13 Zhou R, Yazdi AS, Menu P, Tschopp J. A role for mitochondria in NLRP3 inflammasome activation Nature 2011; 469: 221-5.]. These data suggests that reactive oxygen species and mitochondrial signaling can play a significant role in the assembly and activation of the NLRP3 inflammasome; however whether reactive oxygen species activates other inflammasome platforms is not known. Expression of inflammasome proteins can be found in a wide variety of immune and non-immune cells, including monocytes/macrophages [15 Shalhoub J, Falck-Hansen MA, Davies AH, Monaco C. Innate immunity and monocyte-macrophage activation in atherosclerosis J Inflamm (Lond) 2011; 8: 9. ], T cells [16 Lalor SJ, Dungan LS, Sutton CE, Basdeo SA, Fletcher JM, Mills KH. Caspase-1-processed cytokines IL-1beta and IL-18 promote IL-17 production by gammadelta and CD4 T cells that mediate autoimmunity J Immunol 2011; 186: 5738-48. ], myofibroblasts/fibroblasts [17 Artlett CM, Sassi-Gaha S, Rieger JL, Boesteanu AC, Feghali- Bostwick CA, Katsikis PD. The inflammasome activating caspase- 1 mediates fibrosis and myofibroblast differentiation in systemic sclerosis Arthritis Rheum 2011; 63: 3563-74. ], keratinocytes [18 Dai X, Sayama K, Tohyama M, et al. Mite allergen is a danger signal for the skin via activation of inflammasome in keratinocytes J Allergy Clin Immunol 2011; 127: 806-14.,19 Feldmeyer L, Werner S, French LE, Beer HD. Interleukin-1, inflammasomes and the skin Eur J Cell Biol 2010; 89: 638-44. ], epithelial cells [19 Feldmeyer L, Werner S, French LE, Beer HD. Interleukin-1, inflammasomes and the skin Eur J Cell Biol 2010; 89: 638-44.,20 Mortaz E, Henricks PA, Kraneveld AD, Givi ME, Garssen J, Folkerts G. Cigarette smoke induces the release of CXCL-8 from human bronchial epithelial cells via TLRs and induction of the inflammasome Biochim Biophys Acta 2011; 181: 1104-0. ], and hepatic stellate cells [21 Watanabe A, Sohail MA, Gomes DA, et al. Inflammasome-mediated regulation of hepatic stellate cells Am J Physiol Gastrointest Liver Physiol 2009; 296: G1248-57.] further suggesting the importance of this inflammatory initiating pathway in the immune response. The penultimate role for the assembly of the inflammasome is the cleavage and subsequent activation of caspase-1. Caspase-1 (also called IL-1β converting enzyme, ICE) is first translated as a 45 kDa inactive precursor [22 Walker NP, Talanian RV, Brady KD, et al. Crystal structure of the cysteine protease interleukin-1 beta-converting enzyme: a (p20/p10)2 homodimer Cell 1994; 78: 343-52.] that contains a 15 kDa N-terminal subunit, a central 20 kDa subunit, and a 10 kDa C-terminal subunit [23 Yamin TT, Ayala JM, Miller DK. Activation of the native 45-kDa precursor form of interleukin-1-converting enzyme J Biol Chem 1996; 271: 13273-82.]. The assembly of the inflammasome localizes other caspase-1 proteins together resulting in the autocleavage and activation of caspase-1 [23 Yamin TT, Ayala JM, Miller DK. Activation of the native 45-kDa precursor form of interleukin-1-converting enzyme J Biol Chem 1996; 271: 13273-82.]. The active caspase-1 is comprised of a tetramer consisting of two 20 kDa fragments and two 10 kDa fragments [24 Wilson KP, Black JA, Thomson JA, et al. Structure and mechanism of interleukin-1 beta converting enzyme Nature 1994; 370: 270-5.]. Once activated, caspase-1 is then able to cleave a wide variety of protein precursors, inducing unconventional or leaderless protein secretion that occurs through an ER/Golgi-independent pathway [25 Ogura Y, Sutterwala FS, Flavell RA. The inflammasome: first line of the immune response to cell stress Cell 2006; 126: 659-2.,26 Carta S, Tassi S, Semino C, et al. Histone deacetylase inhibitors prevent exocytosis of interleukin-1beta-containing secretory lysosomes: role of microtubules Blood 2006; 108: 1618-26.]. Many of these proteins cleaved by caspase-1 have a role in the cytoskeleton of the cell [27 Shao W, Yeretssian G, Doiron K, Hussain SN, Saleh M. The caspase-1 digestome identifies the glycolysis pathway as a target during infection and septic shock J Biol Chem 2007; 282: 36321-9.,28 Keller M, Ruegg A, Werner S, Beer H-D. Active caspase-1 is a regulator of unconventional protein secretion Cell 2008; 132: 818-31. ], in glycolysis [27 Shao W, Yeretssian G, Doiron K, Hussain SN, Saleh M. The caspase-1 digestome identifies the glycolysis pathway as a target during infection and septic shock J Biol Chem 2007; 282: 36321-9. ], mitochondria function [28 Keller M, Ruegg A, Werner S, Beer H-D. Active caspase-1 is a regulator of unconventional protein secretion Cell 2008; 132: 818-31. ], and inflammation [28 Keller M, Ruegg A, Werner S, Beer H-D. Active caspase-1 is a regulator of unconventional protein secretion Cell 2008; 132: 818-31.]. In addition, once activated, caspase-1 induces its own secretion [28 Keller M, Ruegg A, Werner S, Beer H-D. Active caspase-1 is a regulator of unconventional protein secretion Cell 2008; 132: 818-31. ], perhaps in a mechanism that limits the cleavage of proteins by caspase-1. The two most studied proteins cleaved by active caspase-1 resulting in their secretion from the cell containing an activated inflammasome are IL-1β and IL-18. IL-1β is processed as a 30.7 kDa inactive protein that is cleaved to the active 17.5 kDa protein. Likewise, IL-18 is initially processed as a larger 22.3 kDa inactive protein that is cleaved by caspase-1 to a 17.3 kDa active form. Once cleaved by caspase-1, both IL-1β and IL-18 are secreted from the cell where they can be involved in autocrine and paracrine signaling. IL-1β and IL-18 are structurally similar and are some of the few proteins known to contain only β-pleated sheets [29 Dinarello CA. Interleukin-18 Methods 1999; 19: 121-32.]. IL-1β is a pleiotropic cytokine that is involved in localized inflammation targeting parasitic, bacterial, or viral infections; or involved in systemic inflammation as a result of chronic disease. IL-1β is produced by many cell types e.g. epithelial cells, fibroblasts, T cells, etc; in response to pathogens or damaged tissues. IL-1β can modulate the expression of its own mRNA via signaling mediated by the IL-1 receptor and the signaling pathways involved induce increased p38 MAPK phosphorylation and NFκB activity [30 Dinarello CA. Interleukin-1 beta, interleukin-18, and the interleukin-1 beta converting enzyme Ann NY Acad Sci 1998; 856: 1-11.]. In cells stimulated with IL-1β, the mRNA levels are sustained for over 24 hours [30 Dinarello CA. Interleukin-1 beta, interleukin-18, and the interleukin-1 beta converting enzyme Ann NY Acad Sci 1998; 856: 1-11. ], whereas in cells stimulated with lipopolysaccharide or phorbol 12-myristate 13-acetate, IL-1β mRNA levels are significantly reduced by 6 hours [31 Fenton MJ, Vermeulen MW, Clark BD, Webb AC, Auron PE. Human pro-IL-1 beta gene expression in monocytic cells is regulated by two distinct pathways J Immunol 1988; 140: 2267-73.]. IL-1β requires two signals for the secretion of the protein; the first signal usually obtained via toll-like receptor signaling or IL-1 receptor signaling upregulates IL-1β gene transcription and the second signal is obtained via inflammasome activation, cleaving caspase-1 leading to IL-1β maturation and secretion. The acute release of IL-1β into the peripheral blood in response to cellular stimuli upregulates the expression of other proinflammatory cytokines such as IL-6; it also raises cortisol levels, and acts on the hypothalamus to induce fever. However in some chronic diseases, the amount of IL-1β that is secreted may not be enough to stimulate the hypothalamus and may only act locally to enhance inflammatory gene expression leading to chronic disease. The function of IL-18 (previously called interferon-γ inducing factor) also participates in downstream inflammasome signaling but the effects of this cytokine are yet to be fully elucidated. Unlike IL-1β, IL-18 is constitutively expressed in its precursor form in many cells and only requires caspase-1 activation for its cleavage and secretion. IL-18 can also be cleaved by proteinase 3 [32 Sugawara S, Uehara A, Nochi T, et al. Neutrophil proteinase 3- mediated induction of bioactive IL-18 secretion by human oral epithelial cells J Immunol 2001; 167: 6568-75. ], whereas cleavage by caspase-3 leads to inactivation of this protein [33 Pirhonen J. Regulation of IL-18 expression in virus infection Scand J Immunol 2001; 53: 533-9.]. IL-1β does not appear to be cleaved by caspase-3 or proteinase 3. Like IL-1β, IL-18 can modulate the expression of its own RNA and its signal transduction is similar to that of IL-1β via NFκB activity [29 Dinarello CA. Interleukin-18 Methods 1999; 19: 121-32.]. IL-18 can activate T cells resulting in the increased synthesis of TNF-α, IL-2, and GM-CSF and polarizes the Th1 response by suppressing IL-4 [29 Dinarello CA. Interleukin-18 Methods 1999; 19: 121-32.]. The initiating molecular mechanisms that are involved in acute and chronic disease are yet to be fully elucidated; however IL-1β and IL-18 appear to be central to both pathologies. What determines whether an acute response to an initiating event with resolution of disease versus a chronic response leading to unresolved disease and fibrosis is still unknown. However, recent studies have demonstrated a dichotomous signaling role by IL-1β and its effects on TGF-β1 expression. In studies by Luo et al. [34 Luo DD, Fielding C, Phillips A, Fraser D. Interleukin-1 beta regulates proximal tubular cell transforming growth factor beta-1 signalling Nephrol Dial Transplant 2009; 24: 2655-65. ], they demonstrate that a short stimulation (minutes) with IL-1β and TGF-β1 resulted in the inhibition of Smad3 phosphorylation and further inhibited downstream TGF-β1 signaling pathways. However, a long exposure (24 hours) with IL-1β and TGF-β1 increased Smad3 phosphorylation [34 Luo DD, Fielding C, Phillips A, Fraser D. Interleukin-1 beta regulates proximal tubular cell transforming growth factor beta-1 signalling Nephrol Dial Transplant 2009; 24: 2655-65.] and induced TGF-β1 expression. In addition, it has been shown that long exposure of microvascular endothelial cells to IL-1β can induce the permanent transformation of these cells to myofibroblasts [35 Chaudhuri V, Zhou L, karasek M. Inflammatory cytokines induce the transformation of human dermal microvascular endothelial cells into myofibroblasts: a potential role in skin fibrogenesis J Cutan Pathol 2007; 34: 146-53. ]; and once differentiated, myofibroblasts synthesize large amounts of collagen. The role of IL-1β in fibrosis and wound healing is now becoming significantly apparent. In vitro studies demonstrate that IL-1β (and IL-1α) can stimulate collagen expression in a dose dependent manner [36 Postlethwaite AE, Raghow R, Stricklin GP, Poppleton H, Seyer JM, Kang AH. Modulation of fibroblast functions by interleukin 1: increased steady-state accumulation of type I procollagen messenger RNAs and stimulation of other functions but not chemotaxis by human recombinant interleukin 1 alpha and beta J Cell Biol 1988; 106: 311-8.]. Transient overexpression of IL-1β in airway epithelial cells promoted the release of TNF-α and IL-6, followed by a significant increase in TGF-β1 and platelet derived growth factor [37 Kolb M, Margetts PJ, Anthony DC, Pitossi F, Gauldie J. Transient expression of IL-1beta induces acute lung injury and chronic repair leading to pulmonary fibrosis J Clin Invest 2001; 107: 1529-36.] that induced the deposition of collagen in the lung. Because IL-1β can induce its own gene expression, chronic activation of the inflammasome, resulting in the continual cleavage of IL-1β in a positive feedback mechanism could conceivably maintain an elevated level of active TGF-β1 protein resulting in fibrosis. To further elucidate the role of IL-1β in the development of fibrosis, an investigation of deep incisional wound healing in mice deficient for IL-1 receptor. Thomay, et al. [38 Thomay AA, Daley JM, Sabo E, et al. Disruption of interleukin-1 signaling improves the quality of wound healing Am J Pathol 2009; 174: 2129-36. ], reported decreased fibrosis, more collagenolytic activity without a decrease in inflammatory cell infiltrates and also reported improved wound healing. More importantly, the tensile strength of the wound was not impaired in this model. In addition, wound fluids contained less IL-6, TGF-β1, and vascular endothelial growth factor. In addition, the administration of Anakinra (IL-1 receptor antagonist) to the deep wounds abrogated wound fibrosis [38 Thomay AA, Daley JM, Sabo E, et al. Disruption of interleukin-1 signaling improves the quality of wound healing Am J Pathol 2009; 174: 2129-36.] further suggesting that IL-1 signaling in this setting is profibrotic. IL-18 has also been shown to be profibrotic. Administration of recombinant IL-18 induced myocardial remodeling and increased interstitial myocardial fibrosis [39 Platis A, Yu Q, Moore D, Khojeini E, Tsau P, Larson D. The effect of daily administration of IL-18 on cardiac structure and function Perfusion 2008; 23: 237-42. ], whereas the direct targeting of IL-18 by the compound Felodipine reduced perivascular fibrosis [40 Xing SS, Tan HW, Bi XP, Zhong M, Zhang Y, Zhang W. Felodipine reduces cardiac expression of IL-18 and perivascular fibrosis in fructose-fed rats Mol Med 2008; 14: 395-402.]. The mode of action of Felodipine is to block calcium channels. Calcium channel signaling has recently been shown to be important for inflammasome activation [41 Pazar B, Ea HK, Narayan S, et al. Basic calcium phosphate crystals induce monocyte/macrophage IL-1beta secretion through the NLRP3 inflammasome in vitro J Immunol 2011; 186: 2495-502.,42 Narayan S, Pazar B, Ea HK, et al. Octacalcium phosphate crystals induce inflammation in vivo through interleukin-1 but independent of the NLRP3 inflammasome in mice Arthritis Rheum 2011; 63: 422-33. ]; therefore, the reduced secretion of IL-18 may in fact be directly due to the inhibition of the inflammasome rather than the direct targeting of Felodipine to IL-18. In vitro studies demonstrate a dose dependent increase in type I and III collagen proteins with recombinant IL-18 and increased collagen gel contraction [43 Fix C, Bingham K, Carver W. Effects of interleukin-18 on cardiac fibroblast function and gene expression Cytokine 2011; 53: 19-28.]. IL-18 was also shown to induce fibroblast proliferation [43 Fix C, Bingham K, Carver W. Effects of interleukin-18 on cardiac fibroblast function and gene expression Cytokine 2011; 53: 19-28.] and interestingly, IL-18 induced α2β1 integrin [43 Fix C, Bingham K, Carver W. Effects of interleukin-18 on cardiac fibroblast function and gene expression Cytokine 2011; 53: 19-28.]. This integrin is one of the major receptors that bind collagens. Other profibrotic molecules have been shown to be increased with the administration of recombinant IL-18 e.g. IL-18 promoted increased osteopontin expression and this was found to coincide with increased in cardiac collagen content [44 Yu Q, Vazquez R, Khojeini EV, Patel C, Venkataramani R, Larson DF. IL-18 induction of osteopontin mediates cardiac fibrosis and diastolic dysfunction in mice Am J Physiol Heart Circ Physiol 2009; 297: H76-85.]. The involvement of the inflammasome in fibrosis is slowly being elucidated. The conundrum is that the inflammasome appears to be involved in many innate responses to pathogens or cellular alarm signals; and yet, fibrosis does not result in every case. In fact, fibrosis seems to be the exception rather than the rule. This suggests that fibrosis resulting from activated inflammasome(s) could be dependent on numerous factors. These factors could include the type of inflammasome(s) that are activated; genetic variation(s) that affect the autocrine or paracrine responses by cells to the inflammasome-mediated signalosome; the cell type that the inflammasome is activated in; or possibly, by a combination of all these factors. Activated fibroblasts (myofibroblasts) not only produce excessive amounts of collagen when the skin is breached they are also able to present antigens [45 Kundig TM, Bachmann MF, DiPaolo C, et al. Fibroblasts as efficient antigen-presenting cells in lymphoid organs Science 1995; 268: 1343-7.]. Historically, fibroblasts have not been considered central to the immune response, however myofibroblasts from different organs have antigen presenting capabilities [46 Bomble M, Tacke F, Rink L, Kovalenko E, Weiskirchen R. Analysis of antigen-presenting functionality of cultured rat hepatic stellate cells and transdifferentiated myofibroblasts Biochem Biophys Res Commun 2010; 396: 342-7.,47 Saada JI, Pinchuk IV, Barrera CA, et al. Subepithelial myofibroblasts are novel nonprofessional APCs in the human colonic mucosa J Immunol 2006; 177: 5968-79.]. What is now becoming apparent is that fibroblasts can function as sentinel cells, capable of becoming activated by bacterial products (or other alarm signals) and once activated secrete cytokines and chemokines [48 Smith RS, Smith TJ, Blieden TM, Phipps RP. Fibroblasts as sentinel cells. Synthesis of chemokines and regulation of inflammation Am J Pathol 1997; 151: 317-22.]. Furthermore, when activated, they have a functional inflammasome [17 Artlett CM, Sassi-Gaha S, Rieger JL, Boesteanu AC, Feghali- Bostwick CA, Katsikis PD. The inflammasome activating caspase- 1 mediates fibrosis and myofibroblast differentiation in systemic sclerosis Arthritis Rheum 2011; 63: 3563-74.]. Under normal wound healing conditions, myofibroblast differentiation and activation results in the synthesis of high levels of collagen. Once the wound is closed, myofibroblasts usually undergo apoptosis; however, when this mechanism becomes dysregulated chronically activated myofibroblasts can cause progressive fibrosis. Gasse et al., [49 Gasse P, Mary C, Guenon I, et al. IL-1R1/MyD88 signaling and the inflammasome are essential in pulmonary inflammation and fibrosis in mice J Clin Invest 2007; 117: 3786-99.] were the first to investigate the connection between the inflammasome, the IL-1 receptor, and MyD88 signaling with fibrosis. Mice that were deficient in the ASC protein had attenuated responses to the profibrotic compound, bleomycin. This extensive study demonstrated the integral role of IL-1 signaling via its receptor (IL-1R1) and MyD88 in pulmonary fibrosis. In mice that were IL-1R1 deficient and those that were MyD88 deficient had an abrogated responses to bleomycin. Furthermore, the direct administration of recombinant mouse IL-1β to the lungs of wild-type mice mediated a marked increase in tissue destruction with inflammation and collagen deposition. The addition of IL-1 receptor antagonist appeared to be more effective at limiting fibrosis in the wild-types than the administration of IL-1β neutralizing antibodies. IL-1β production was found to be more dependent on the ASC inflammasome signaling rather than toll-like receptor signaling [49 Gasse P, Mary C, Guenon I, et al. IL-1R1/MyD88 signaling and the inflammasome are essential in pulmonary inflammation and fibrosis in mice J Clin Invest 2007; 117: 3786-99.]. Recently, it was found that uric acid is released into the lungs when cells are stimulated with bleomycin [50 Gasse P, Riteau N, Charron S, et al. Uric acid is a danger signal activating NALP3 inflammasome in lung injury inflammation and fibrosis Am J Respir Crit Care Med 2009; 179: 903-13.] and can act as a danger signal. It is thought that the localized increase in uric acid results in the deposition of crystals inducing cell membrane damage causing activation of NLRP3, and release of IL-1β. Gasse et al., [50 Gasse P, Riteau N, Charron S, et al. Uric acid is a danger signal activating NALP3 inflammasome in lung injury inflammation and fibrosis Am J Respir Crit Care Med 2009; 179: 903-13.] demonstrated that inflammatory signaling mediated by uric acid was dependent on IL-1 receptor, MyD88 and the NLRP3 inflammasome, and that this could be an autocrine loop mediating fibrosis. They found that caspase-1 deficient mice had an attenuated responses to bleomycin. They also demonstrate that there is some cross-talk between TLR2 and TLR4 as TLR2 and TLR4 deficient mice had abrogated responses to uric acid. Studies on elastase-induced emphysema by this same group, also demonstrated that alveolar breakdown and subsequent fibrosis in the lung was dependent on ASC inflammasome-mediated signaling that released IL-1β. This finding could be attenuated with the IL-1 receptor antagonist, Anakinra [51 Couillin I, Vasseur V, Charron S, et al. IL-1R1/MyD88 signaling is critical for elastase-induced lung inflammation and emphysema J Immunol 2009; 183: 8195-202.]. Furthermore, Couillin et al., [51 Couillin I, Vasseur V, Charron S, et al. IL-1R1/MyD88 signaling is critical for elastase-induced lung inflammation and emphysema J Immunol 2009; 183: 8195-202.] demonstrated that the administration of elastase caused the dying cells to released uric acid. The subsequent addition of uric acid crystals to murine airways resulted in a transient increase in tissue inhibitor of metalloproteinases [50 Gasse P, Riteau N, Charron S, et al. Uric acid is a danger signal activating NALP3 inflammasome in lung injury inflammation and fibrosis Am J Respir Crit Care Med 2009; 179: 903-13. ], a protein that inhibits extracellular matrix degradation. Importantly, the release of IL-1β in this model was not found to be cause by elastase cleavage of pro-IL-1β but was mediated via the activity of caspase-1 [51 Couillin I, Vasseur V, Charron S, et al. IL-1R1/MyD88 signaling is critical for elastase-induced lung inflammation and emphysema J Immunol 2009; 183: 8195-202.]. Silicosis has also been reported to be driven by the NLRP3 inflammasome resulting in the excessive deposition of collagen and recruitment of inflammatory cells to the damaged tissues [52 Cassel SL, Eisenbarth SC, Lyer SS, et al. The NALP3 inflammasome is essential for the development of silicosis Proc Natl Acad Sci USA 2008; 105: 9035-40.]. Cassel et al., [52 Cassel SL, Eisenbarth SC, Lyer SS, et al. The NALP3 inflammasome is essential for the development of silicosis Proc Natl Acad Sci USA 2008; 105: 9035-40.] found that the silica crystals induced reactive oxygen species in macrophages. In elegant studies, they found that by blocking the generation of reactive oxygen species this inhibited the activation of caspase-1, and the subsequent release of IL-1β and collagen synthesis. These studies further confirm the role of reactive oxygen species in NLRP3 inflammasome signaling and suggest that reactive oxygen species may promote a profibrotic phenotype. We recently reported the role of the inflammasome in the fibrotic disease systemic sclerosis (SSc) [17 Artlett CM, Sassi-Gaha S, Rieger JL, Boesteanu AC, Feghali- Bostwick CA, Katsikis PD. The inflammasome activating caspase- 1 mediates fibrosis and myofibroblast differentiation in systemic sclerosis Arthritis Rheum 2011; 63: 3563-74.] that mediated the increased secretion of collagen and induced myofibroblast differentiation. In a study investigating inflammasome gene expression and downstream inflammasome-mediated signaling products, we identified 40 genes that were upregulated greater than 2-fold. Several of these genes were found to be inflammasome platforms e.g. AIM2 and NLRP3. AIM2 is a sensor for cellular microbial dsDNA [53 Vilaysane A, Muruve DA. The innate immune response to DNA Semin Immunol 2009; 21: 208-14.] and NLRP3 is a general sensor for cellular stress [54 Martinon F. Detection of immune danger signals by NALP3 J Leukoc Biol 2008; 83: 507-11.]. Furthermore, caspase-1 activity was upregulated approximately 2-fold in SSc fibroblasts and we found that fibroblasts isolated from the fibrotic lesions secreted more IL-1β and IL-18 protein and that this secretion could be abrogated with chemical or siRNA inhibition of caspase-1 [17 Artlett CM, Sassi-Gaha S, Rieger JL, Boesteanu AC, Feghali- Bostwick CA, Katsikis PD. The inflammasome activating caspase- 1 mediates fibrosis and myofibroblast differentiation in systemic sclerosis Arthritis Rheum 2011; 63: 3563-74.]. This data suggests that the release of IL-1β and IL-18 is mediated by an inflammasome activation mechanism that is driving fibrosis. To test this hypothesis we inhibited caspase-1 and observed a significant reduction in the secretion of hydroxyproline (total collagen) by SSc fibroblasts [17 Artlett CM, Sassi-Gaha S, Rieger JL, Boesteanu AC, Feghali- Bostwick CA, Katsikis PD. The inflammasome activating caspase- 1 mediates fibrosis and myofibroblast differentiation in systemic sclerosis Arthritis Rheum 2011; 63: 3563-74.]. The pathogenic cell that drives the increased collagen synthesis in the skin and organs is the myofibroblast. Inhibition of caspase-1 (chemically and with siRNA) reduced the expression of α-smooth muscle actin. Specifically, we observed that α-smooth muscle actin stress fibers contained less protein and were thinner in diameter in myofibroblasts treated with caspase-1 inhibition, whereas f-actin remain unchanged [17 Artlett CM, Sassi-Gaha S, Rieger JL, Boesteanu AC, Feghali- Bostwick CA, Katsikis PD. The inflammasome activating caspase- 1 mediates fibrosis and myofibroblast differentiation in systemic sclerosis Arthritis Rheum 2011; 63: 3563-74.]. Furthermore, endogenous levels of α-smooth muscle protein and f-actin in quiescent fibroblasts remained unaltered. We confirmed the role of the inflammasome in fibrosis and found that ASC deficient and NLRP3 deficient mice had abrogated collagen deposition in the dermis when injected subcutaneously with bleomycin. Furthermore, as bleomycin induces circulating IL-1β and IL-18 we did not observe pulmonary fibrosis in the lungs of these mice, whereas the wild-type mice had increased deposition of collagen in the lung. In SSc, fibrosis directly correlates with morbidity and mortality. Our findings implicate that caspase-1 activity is directly involved in SSc fibrosis and suggests that there may be autocrine signaling mediated by IL-1β and/or IL-18 that promotes the profibrotic phenotype in these patients. The etiology of SSc is elusive and chemicals and pathogens have been previously reported in the pathogenesis of this disease [55 Radic M, Martinovic KD, Radic J. Infectious disease as aetiological factor in the pathogenesis of systemic sclerosis Neth J Med 2010; 68: 348-53., 56 Haustein U-F, Herrmann K. Environmental scleroderma Clin Dermatol 1994; 12: 467-73.]. One hypothesis is that oxidative stress precedes fibrosis in SSc tissues further implicating the role for the inflammasome in disease pathogenesis [57 Gabrielli A, Svegliati S, Moroncini G, Pomponio G, Santillo M, Avvedimento EV. Oxidative stress and the pathogenesis of scleroderma: the Murrell's hypothesis revisited Semin Immunopathol 2008; 30: 329-7.]. It is now becoming apparent that other fibrotic diseases can be mediated by NLRP3 inflammasome signaling. The liver is easily injured by viruses and chemicals and responds to these insults by establishing inflammation that can lead to fibrosis. Like other tissues, fibrosis in the liver is a result of excessive collagen production accompanied by reduced extracellular matrix degradation. Upon activation, hepatic stellate cells differentiate into myofibroblasts and upregulate collagen secretion. Hepatic stellate cells are very similar to the type of myofibroblasts that are found in injured skin and are able to phagocytose, present antigen, contain α-smooth muscle actin stress fibers, and are capable of migration [58 Friedman SL. Hepatic stellate cells: protean, multifunctional, and enigmatic cells of the liver Physiol Rev 2008; 88: 125-72.]. Thus, the finding that monosodium urate crystals could also activate the inflammasome in hepatic stellate cells resulting in the increase in collagen deposition in the liver is further suggestive that this important signaling pathway could be central to fibrotic diseases. In a study by Watanabe et al. [21 Watanabe A, Sohail MA, Gomes DA, et al. Inflammasome-mediated regulation of hepatic stellate cells Am J Physiol Gastrointest Liver Physiol 2009; 296: G1248-57. ], they were able to demonstrate that the liver antagonist monosodium urate upregulated TGF-β1 and type I collagen, induced the reorganization of actin, and promoted cellular stellation. These features were abrogated in NLRP3 and ASC deficient mice. Further support to these findings has led to the report by Gieling et al. [59 Gieling RG, Wallace K, Han YP. Interleukin-1 participates in the progression from liver injury to fibrosis Am J Physiol Gastrointest Liver Physiol 2009; 296: G1324-31. ], who showed that IL-1 mediates the progression of liver fibrosis. They demonstrate that on injury with thioacetamide, IL-1α and IL-1β peak on day 1 followed by a peak in type I collagen on day 3. They also demonstrate the increase in α-smooth muscle actin indicative of myofibroblast differentiation. Further evidence that the inflammasome can promote fibrosis was demonstrated in a study on cardiac fibroblasts [60 Kawaguchi M, Takahashi M, Hata T, et al. Inflammasome activation of cardiac fibroblasts is essential for myocardial ischemia/reperfusion injury Circulation 2011; 123: 594-604.]. These studies support the finding that hypoxia with reoxygenation mediated by reactive oxygen species and potassium efflux stimulated the inflammasome in cardiac fibroblasts but did not stimulate the inflammasome in cardiomyocytes. Because cardiac fibroblasts can proliferate in the heart and produce extracellular matrix proteins, cytokine and growth factors, this investigation underlies the fact that these cells can act as sentinel cells able to sense danger signals resulting from ischemia/reperfusion to enhance the inflammatory response in the heart inducing deposition of collagens [60 Kawaguchi M, Takahashi M, Hata T, et al. Inflammasome activation of cardiac fibroblasts is essential for myocardial ischemia/reperfusion injury Circulation 2011; 123: 594-604.]. In ASC deficient mice, there was attenuated numbers of infiltrating macrophages and neutrophils in response to the ischemia. Taken together, these studies on fibroblasts and organs (lung, skin, heart, and liver); have demonstrate that the NLRP3 inflammasome can orchestrate the development of fibrosis in both sterile conditions and in pathogen driven models. In a fibrotic setting, a chronically activated inflammasome mediating the continuous release of IL-1β and IL-18, that induces autocrine signaling in fibroblasts could conceivably maintained the profibrotic phenotype in fibroblasts (Fig. 1 ). Whether fibroblasts require the activation of the NLRP3 inflammasome only, or require activation of other inflammasomes is yet to be determined. What is apparent is the cooperative regulation between TGF-β1 and IL-1β in maintaining an autocrine signaling loop mediated through the ERK1/2 signaling pathways [61 Aoki H, Ohnishi H, Hama K, et al. Autocrine loop between TGF-beta1 and IL-1beta through Smad3- and ERK-dependent pathways in rat pancreatic stellate cells Am J Physiol Cell Physiol 2006; 290: C1100-8.] that is most likely operational in any cell capable of expressing collagens. Furthermore, TGF-β1 and IL-1β exhibited synergistic effects in promoting collagen stiffness [62 Leung LY, Tian D, Brangwynne CP, Weitz DA, Tschumperlin DJ. A new microrheometric approach reveals individual and cooperative roles for TGF-beta1 and IL-1beta in fibroblast-mediated stiffening of collagen gels FASEB J 2007; 21: 2064-73.] that may further promote the secretion of additional collagens into the extracellular space and/or the additional release of TGF-β1 [63 Belmadani S, Zerfaoui M, Boulares HA, Palen DI, Matrougui K. Microvessel vascular smooth muscle cells contribute to collagen type I deposition through ERK1/2 MAP kinase, alphavbeta3- integrin, and TGF-beta1 in response to ANG II and high glucose Am J Physiol Heart Circ Physiol 2008; 295: H69-76.]. Understanding the role of the NLRP3 inflammasome in chronic diseases that promote collagen synthesis will elucidate novel targets for therapy for this spectrum of diseases that to date, are difficult to treat. One of these therapies could be Colchicine as retroperitoneal fibrosis responds well to Colchicine therapy [64 De SG, Cerquaglia C, Curigliano V, et al. Association between familial mediterranean fever and retroperitoneal fibrosis: retroperitoneal fibrosis regression after colchicine therapy Int J Immunopathol Pharmacol 2009; 22: 521-4.]. Autocrine signaling of IL-1β or IL-18 mediated by an activated inflammasome could promote myofibroblast differentiation and collagen deposition leading to fibrosis. Danger signals such as bleomycin, muramyl dipeptide, and various pathogen-related danger signals induce the assembly of the inflammasome. Once assembled the inflammasome mediates the cleavage of caspase-1 into its active form. Caspase-1 is then able to proteolytically cleave pro-IL-1β and pro-IL-18 to their mature active forms and these cytokines are secreted from the cell via a mechanism that is not fully understood. Both active IL-1β and IL-18 can autocrine signal in the fibroblast to upregulate p38 MAPK, JNK, and ERK1/2 signaling pathways resulting in increased gene expression e.g. TGF-β1 and other profibrotic genes. Active TGF-β1 is secreted from the cell and this in turn could autocrine signal to stimulate further collagen synthesis and increased α-smooth muscle actin incorporation into stress fibers that are indicative of myofibroblast differentiation. Wynn TA. Cellular and molecular mechanisms of fibrosis J Pathol 2008; 214: 199-210. Wootton SC, Kim DS, Kondoh Y, et al. Viral infection in acute exacerbation of idiopathic pulmonary fibrosis Am J Respir Crit Care Med 2011; 183: 1698-702. Collazos J, Carton JA, Asensi V. Immunological status does not influence hepatitis c virus or liver fibrosis in HIV-hepatitis C virus-coinfected patients AIDS Res Hum Retroviruses 2011; 27: 383-9. Yarnold J, Brotons MC. 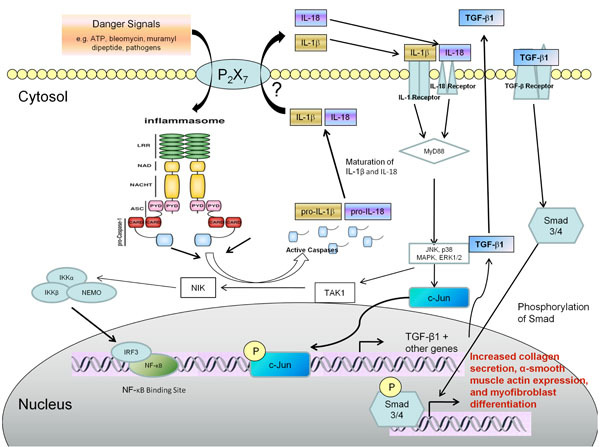 Pathogenetic mechanisms in radiation fibrosis Radiother Oncol 2010; 97: 149-61. Daba MH, El-Tahir KE, Al-Arifi MN, Gubara OA. Drug-induced pulmonary fibrosis Saudi Med J 2004; 25: 700-6. Martinon F, Tschopp J. NLRs join TLRs as innate sensors of pathogens Trends Immunol 2005; 26: 447-54. Bella J, Hindle KL, McEwan PA, Lovell SC. The leucine-rich repeat structure Cell Mol Life Sci 2008; 65: 2307-33. Hindle KL, Bella J, Lovell SC. Quantitative analysis and prediction of curvature in leucine-rich repeat proteins Proteins 2009; 77: 342-58. Bell JK, Botos I, Hall PR, et al. The molecular structure of the Toll-like receptor 3 ligand-binding domain Proc Natl Acad Sci USA 2005; 102: 10976-80. Inohara N, Nunez G. The NOD: a signaling module that regulates apoptosis and host defense against pathogens Oncogene 2001; 20: 6473-81. Kanneganti TD, Lamkanfi M, Nunez G. Intracellular NOD-like receptors in host defense and disease Immunity 2007; 27: 549-9. Dostert C, Petrilli V, van Bruggen R, Steele C, Mossman BT, Tschopp J. Innate immune activation through NALP3 inflammasome sensing of asbestos and silica Science 2008; 320: 674-7. Zhou R, Yazdi AS, Menu P, Tschopp J. A role for mitochondria in NLRP3 inflammasome activation Nature 2011; 469: 221-5. West AP, Shadel GS, Ghosh S. Mitochondria in innate immune responses Nat Rev Immunol 2011; 11: 389-402. Shalhoub J, Falck-Hansen MA, Davies AH, Monaco C. Innate immunity and monocyte-macrophage activation in atherosclerosis J Inflamm (Lond) 2011; 8: 9. Lalor SJ, Dungan LS, Sutton CE, Basdeo SA, Fletcher JM, Mills KH. Caspase-1-processed cytokines IL-1beta and IL-18 promote IL-17 production by gammadelta and CD4 T cells that mediate autoimmunity J Immunol 2011; 186: 5738-48. Artlett CM, Sassi-Gaha S, Rieger JL, Boesteanu AC, Feghali- Bostwick CA, Katsikis PD. The inflammasome activating caspase- 1 mediates fibrosis and myofibroblast differentiation in systemic sclerosis Arthritis Rheum 2011; 63: 3563-74. Dai X, Sayama K, Tohyama M, et al. Mite allergen is a danger signal for the skin via activation of inflammasome in keratinocytes J Allergy Clin Immunol 2011; 127: 806-14. Feldmeyer L, Werner S, French LE, Beer HD. Interleukin-1, inflammasomes and the skin Eur J Cell Biol 2010; 89: 638-44. Mortaz E, Henricks PA, Kraneveld AD, Givi ME, Garssen J, Folkerts G. Cigarette smoke induces the release of CXCL-8 from human bronchial epithelial cells via TLRs and induction of the inflammasome Biochim Biophys Acta 2011; 181: 1104-0. Watanabe A, Sohail MA, Gomes DA, et al. Inflammasome-mediated regulation of hepatic stellate cells Am J Physiol Gastrointest Liver Physiol 2009; 296: G1248-57. Walker NP, Talanian RV, Brady KD, et al. Crystal structure of the cysteine protease interleukin-1 beta-converting enzyme: a (p20/p10)2 homodimer Cell 1994; 78: 343-52. Yamin TT, Ayala JM, Miller DK. Activation of the native 45-kDa precursor form of interleukin-1-converting enzyme J Biol Chem 1996; 271: 13273-82. Wilson KP, Black JA, Thomson JA, et al. Structure and mechanism of interleukin-1 beta converting enzyme Nature 1994; 370: 270-5. Ogura Y, Sutterwala FS, Flavell RA. The inflammasome: first line of the immune response to cell stress Cell 2006; 126: 659-2. Carta S, Tassi S, Semino C, et al. Histone deacetylase inhibitors prevent exocytosis of interleukin-1beta-containing secretory lysosomes: role of microtubules Blood 2006; 108: 1618-26. Shao W, Yeretssian G, Doiron K, Hussain SN, Saleh M. The caspase-1 digestome identifies the glycolysis pathway as a target during infection and septic shock J Biol Chem 2007; 282: 36321-9. Keller M, Ruegg A, Werner S, Beer H-D. Active caspase-1 is a regulator of unconventional protein secretion Cell 2008; 132: 818-31. Dinarello CA. Interleukin-18 Methods 1999; 19: 121-32. Dinarello CA. Interleukin-1 beta, interleukin-18, and the interleukin-1 beta converting enzyme Ann NY Acad Sci 1998; 856: 1-11. Fenton MJ, Vermeulen MW, Clark BD, Webb AC, Auron PE. Human pro-IL-1 beta gene expression in monocytic cells is regulated by two distinct pathways J Immunol 1988; 140: 2267-73. Sugawara S, Uehara A, Nochi T, et al. Neutrophil proteinase 3- mediated induction of bioactive IL-18 secretion by human oral epithelial cells J Immunol 2001; 167: 6568-75. Pirhonen J. Regulation of IL-18 expression in virus infection Scand J Immunol 2001; 53: 533-9. Luo DD, Fielding C, Phillips A, Fraser D. Interleukin-1 beta regulates proximal tubular cell transforming growth factor beta-1 signalling Nephrol Dial Transplant 2009; 24: 2655-65. Chaudhuri V, Zhou L, karasek M. Inflammatory cytokines induce the transformation of human dermal microvascular endothelial cells into myofibroblasts: a potential role in skin fibrogenesis J Cutan Pathol 2007; 34: 146-53. Postlethwaite AE, Raghow R, Stricklin GP, Poppleton H, Seyer JM, Kang AH. Modulation of fibroblast functions by interleukin 1: increased steady-state accumulation of type I procollagen messenger RNAs and stimulation of other functions but not chemotaxis by human recombinant interleukin 1 alpha and beta J Cell Biol 1988; 106: 311-8. Kolb M, Margetts PJ, Anthony DC, Pitossi F, Gauldie J. Transient expression of IL-1beta induces acute lung injury and chronic repair leading to pulmonary fibrosis J Clin Invest 2001; 107: 1529-36. Thomay AA, Daley JM, Sabo E, et al. Disruption of interleukin-1 signaling improves the quality of wound healing Am J Pathol 2009; 174: 2129-36. Platis A, Yu Q, Moore D, Khojeini E, Tsau P, Larson D. The effect of daily administration of IL-18 on cardiac structure and function Perfusion 2008; 23: 237-42. Xing SS, Tan HW, Bi XP, Zhong M, Zhang Y, Zhang W. Felodipine reduces cardiac expression of IL-18 and perivascular fibrosis in fructose-fed rats Mol Med 2008; 14: 395-402. Pazar B, Ea HK, Narayan S, et al. Basic calcium phosphate crystals induce monocyte/macrophage IL-1beta secretion through the NLRP3 inflammasome in vitro J Immunol 2011; 186: 2495-502. Narayan S, Pazar B, Ea HK, et al. 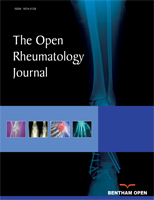 Octacalcium phosphate crystals induce inflammation in vivo through interleukin-1 but independent of the NLRP3 inflammasome in mice Arthritis Rheum 2011; 63: 422-33. Fix C, Bingham K, Carver W. Effects of interleukin-18 on cardiac fibroblast function and gene expression Cytokine 2011; 53: 19-28. Yu Q, Vazquez R, Khojeini EV, Patel C, Venkataramani R, Larson DF. IL-18 induction of osteopontin mediates cardiac fibrosis and diastolic dysfunction in mice Am J Physiol Heart Circ Physiol 2009; 297: H76-85. Kundig TM, Bachmann MF, DiPaolo C, et al. Fibroblasts as efficient antigen-presenting cells in lymphoid organs Science 1995; 268: 1343-7. Bomble M, Tacke F, Rink L, Kovalenko E, Weiskirchen R. Analysis of antigen-presenting functionality of cultured rat hepatic stellate cells and transdifferentiated myofibroblasts Biochem Biophys Res Commun 2010; 396: 342-7. Saada JI, Pinchuk IV, Barrera CA, et al. Subepithelial myofibroblasts are novel nonprofessional APCs in the human colonic mucosa J Immunol 2006; 177: 5968-79. Smith RS, Smith TJ, Blieden TM, Phipps RP. Fibroblasts as sentinel cells. Synthesis of chemokines and regulation of inflammation Am J Pathol 1997; 151: 317-22. Gasse P, Mary C, Guenon I, et al. IL-1R1/MyD88 signaling and the inflammasome are essential in pulmonary inflammation and fibrosis in mice J Clin Invest 2007; 117: 3786-99. Gasse P, Riteau N, Charron S, et al. Uric acid is a danger signal activating NALP3 inflammasome in lung injury inflammation and fibrosis Am J Respir Crit Care Med 2009; 179: 903-13. Couillin I, Vasseur V, Charron S, et al. IL-1R1/MyD88 signaling is critical for elastase-induced lung inflammation and emphysema J Immunol 2009; 183: 8195-202. Cassel SL, Eisenbarth SC, Lyer SS, et al. The NALP3 inflammasome is essential for the development of silicosis Proc Natl Acad Sci USA 2008; 105: 9035-40. Vilaysane A, Muruve DA. The innate immune response to DNA Semin Immunol 2009; 21: 208-14. Martinon F. Detection of immune danger signals by NALP3 J Leukoc Biol 2008; 83: 507-11. Radic M, Martinovic KD, Radic J. Infectious disease as aetiological factor in the pathogenesis of systemic sclerosis Neth J Med 2010; 68: 348-53. Haustein U-F, Herrmann K. Environmental scleroderma Clin Dermatol 1994; 12: 467-73. Gabrielli A, Svegliati S, Moroncini G, Pomponio G, Santillo M, Avvedimento EV. Oxidative stress and the pathogenesis of scleroderma: the Murrell's hypothesis revisited Semin Immunopathol 2008; 30: 329-7. Friedman SL. Hepatic stellate cells: protean, multifunctional, and enigmatic cells of the liver Physiol Rev 2008; 88: 125-72. Gieling RG, Wallace K, Han YP. Interleukin-1 participates in the progression from liver injury to fibrosis Am J Physiol Gastrointest Liver Physiol 2009; 296: G1324-31. Kawaguchi M, Takahashi M, Hata T, et al. Inflammasome activation of cardiac fibroblasts is essential for myocardial ischemia/reperfusion injury Circulation 2011; 123: 594-604. Aoki H, Ohnishi H, Hama K, et al. Autocrine loop between TGF-beta1 and IL-1beta through Smad3- and ERK-dependent pathways in rat pancreatic stellate cells Am J Physiol Cell Physiol 2006; 290: C1100-8. Leung LY, Tian D, Brangwynne CP, Weitz DA, Tschumperlin DJ. A new microrheometric approach reveals individual and cooperative roles for TGF-beta1 and IL-1beta in fibroblast-mediated stiffening of collagen gels FASEB J 2007; 21: 2064-73. Belmadani S, Zerfaoui M, Boulares HA, Palen DI, Matrougui K. Microvessel vascular smooth muscle cells contribute to collagen type I deposition through ERK1/2 MAP kinase, alphavbeta3- integrin, and TGF-beta1 in response to ANG II and high glucose Am J Physiol Heart Circ Physiol 2008; 295: H69-76. De SG, Cerquaglia C, Curigliano V, et al. Association between familial mediterranean fever and retroperitoneal fibrosis: retroperitoneal fibrosis regression after colchicine therapy Int J Immunopathol Pharmacol 2009; 22: 521-4.